It’s getting late, so I’ll be quick. 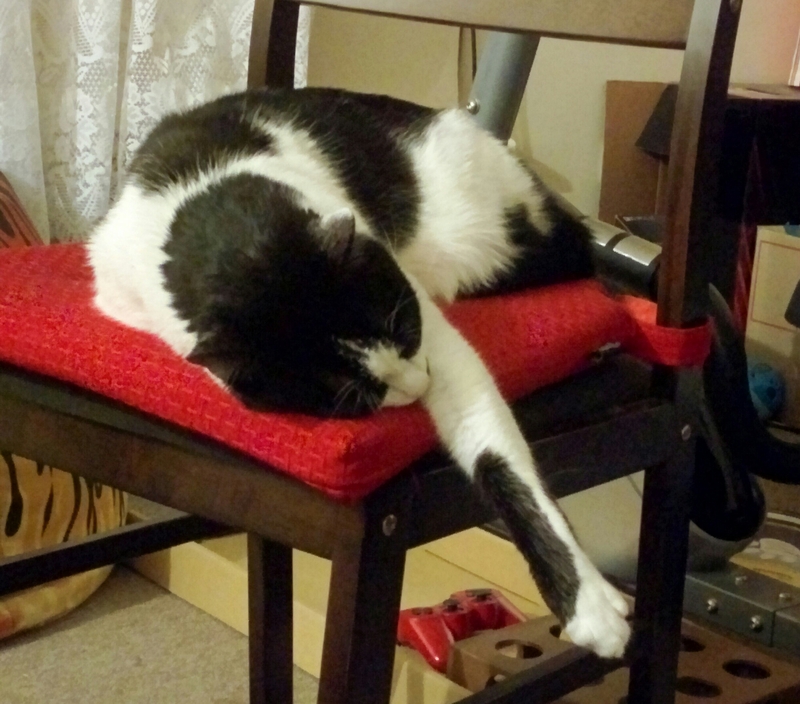 Even the cats are tired from chasing all the moths that spring has brought. With the birthday money that I received, I decided I needed to invest in a new trimmer as I was getting increasingly impatient with my old one, which left so many burrs on the edge of the paper that I needed to use a pair of scissors anyway. After researching, looking at sites and reviews, ( which I rarely do, but my partner does for everything, to the point it’s annoying and I know more about his purchase options than I ever wished to.) I came to the conclusion that the GBC 4 in 1 rotary trimmer, while looked great, didn’t have any reviews, and I wasn’t willing to pay $200 on a gamble. So watching videos and looking at Amazon reviews, (not to buy on there, of course, they are awful at shipping to Australia,) and I found some useful information in reviews, which led me to look at the Dahle brand. 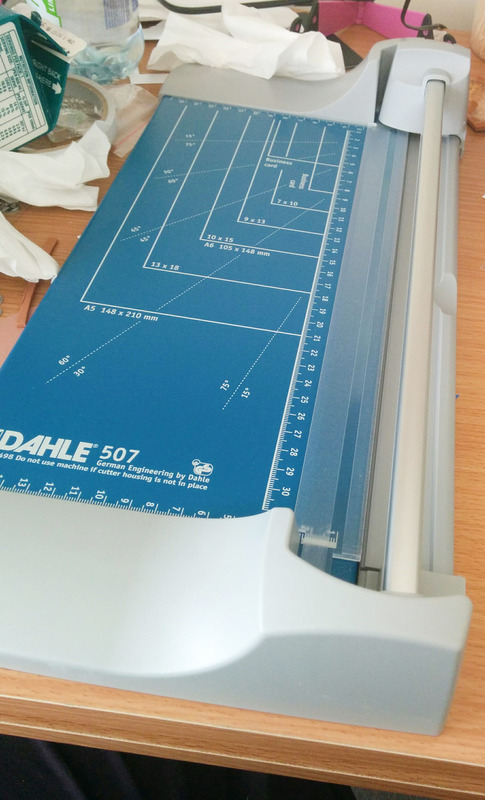 I originally looked at the Dahle 550, but as I’m not going to be cutting on a business level, I didn’t need the industrial version, and found that the Dahle 507 was more suitable for me, and a bit cheaper. Here he is, all lovely like. 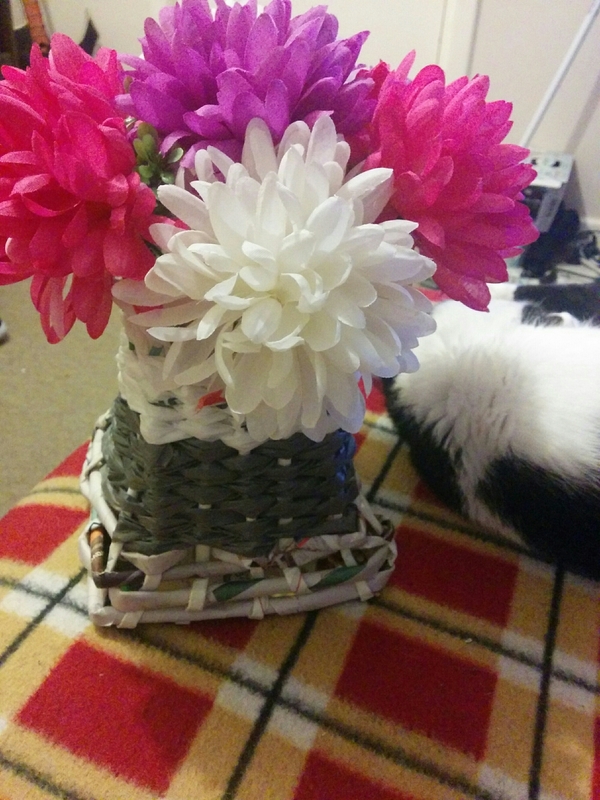 Excuse the mess… I’m creative. I’ve only used it a few times, between naps as I wasn’t feeling well, but he’ll get a lot of use soon with the Christmas cards. I think I’ll call him Roald, as Roald Dahl is my favourite author, and it suits him. So much for being quick. Goodnight. A few weeks ago, when I bought a bunch of craft supplies online, I ordered some X-PressIt blending card. This is a nice smooth cardstock, that’s designed to work well with Copic markers. I’ve been meaning to buy some for ages, then when I finally received it, it took me a while to plan what I wanted, and when I couldn’t decide, it was left even longer. Finally, yesterday, I decided to just go for it. I cut an A4 piece into quarters, so I could budget my ten pages, and not feel daunted by a whole page, or annoyed if it turned out badly. The paper was lovely to work on, and felt smoother than regular cardstock. As written on the packet, blending was lovely. 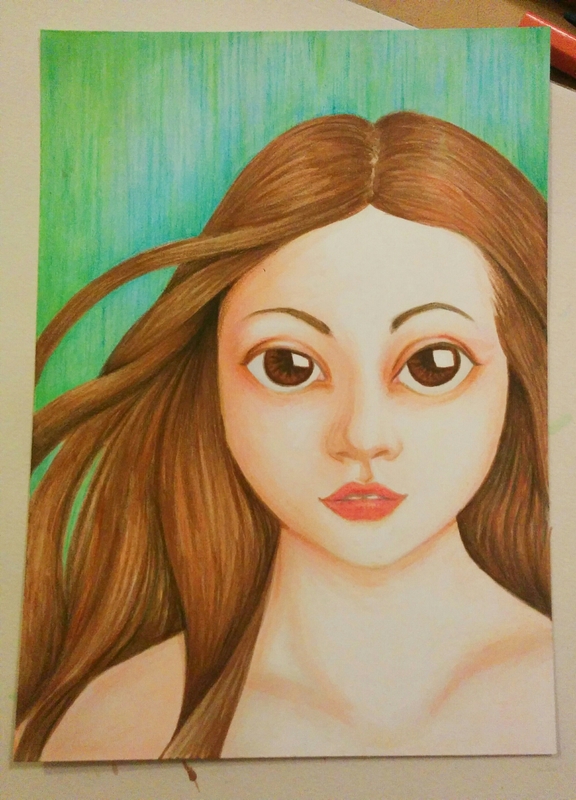 I did add coloured pencil over the top of the markers, to add details and get a better variety where my Copic marker collection is lacking, and due to no roughness in the paper (tooth, as it’s often referred to), layering the pencil got a bit difficult and waxy. I could help this by adding some workable fixative before working on it more. She’s rather pale, as I wasn’t willing to take too many risks, and the picture I was loosely referencing was very brightly lit, so I even had to enhance what little shadow there was to make it more colourful. I have been wanting to play with clay for so long, but with the inspection and no space available, it wasn’t an achievable goal. I had even bought some clay tools that I was waiting to use, and today was finally the day. 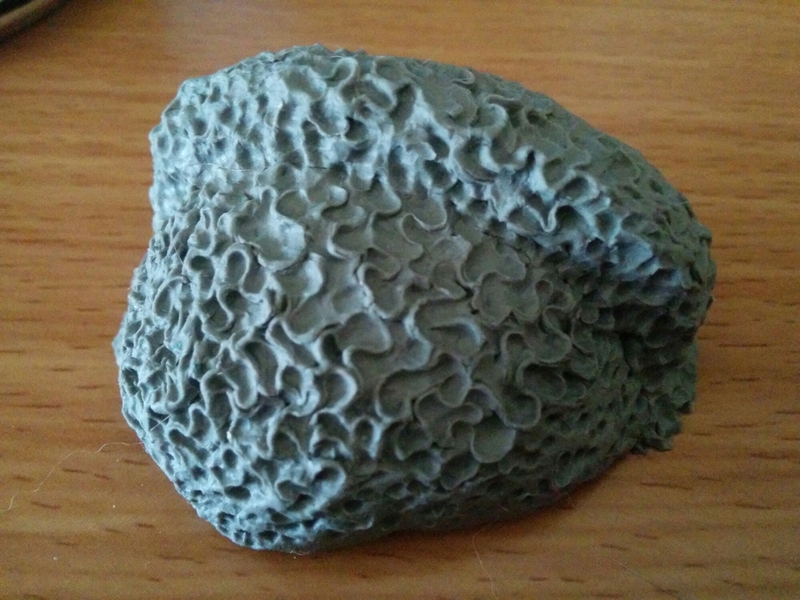 While waiting, I had been looking at pictures and videos as well as playing with textures on my bluetac eraser. 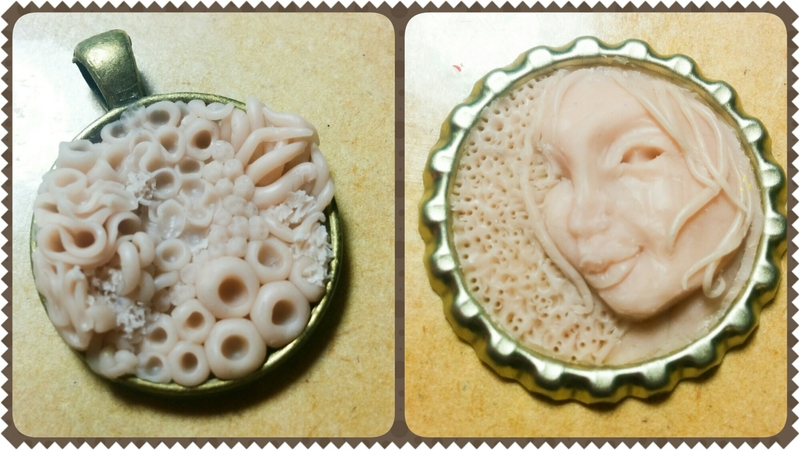 I had the idea of making relief sculptures in bottle caps, and had lots of fun creating the two pendants above. I’m a little worried, as I researched whether bottle caps can be heated in the oven, and it said they should be fine. I’m a bit worried about the other one, as it’s a bezel of unknown materials. I quite like the coral filled one, but if it doesn’t work, I can always build the clay onto a circle and glue it on after baking. One main reason I am back into bottle cap creations, is that I bought a tiny hand drill, used for jewellery, which makes holes in various materials, like aluminium. I was hoping it would go through shell as well, but it’s not working well on it. Maybe I just need to get the right size combination. I’ve been able to go through pencils, layered cardboard, and wood with no problems. I was cleaning today (a bit,) and I found a scrap of paper on the floor. I actually found quite a few, but this one gave me some inspiration. It had been punched with a maple leaf punch, and torn in just the right way that made me think of Godzilla rising out of the ocean. I used the piece of paper as a template, and filled in details, before colouring in the scene with pencils. Cat for size reference. Though the cat is large.